I had been looking for Dante’s Stone for years. Not every day mind you, but off and on … for years. 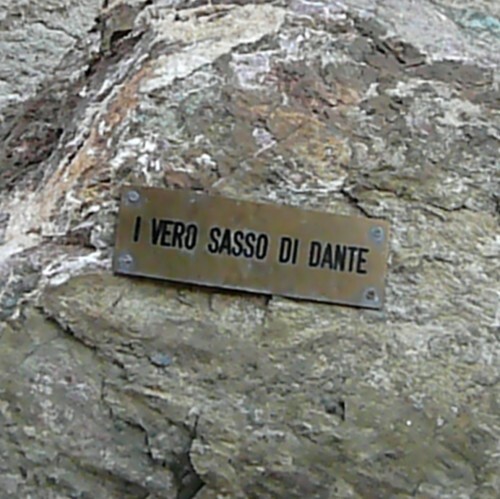 The story of the Sasso di Dante has been talked about for centuries. Seven centuries to be exact, because the last time Dante could have sat on his rock was 1302; that year he was banished from Florence, never to return. Guidebooks told me that the stone was gone. No big surprise. 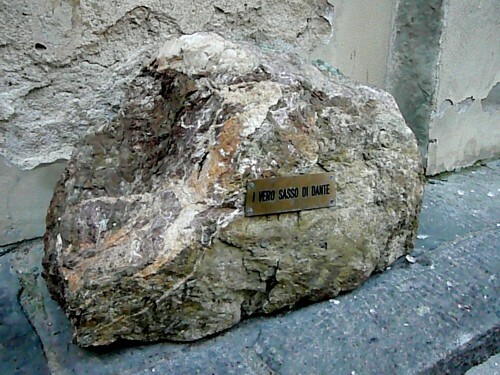 But it was repeatedly reported that a plaque had been placed on a wall where the rock sat and where Dante sat on the rock. 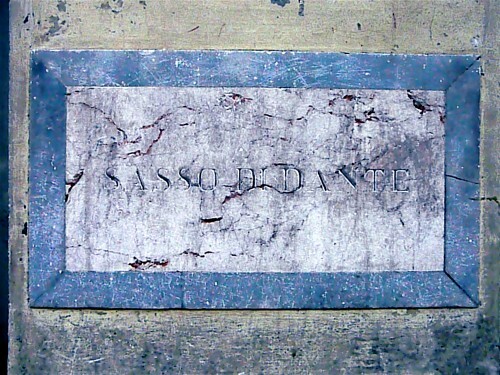 It was supposed to be on the wall in Piazza delle Pallottole. I looked on every wall in the tiny piazza. I couldn’t find the plaque. From the stories that have filtered down through the ages, you would think that Dante never did anything, but jot poems. 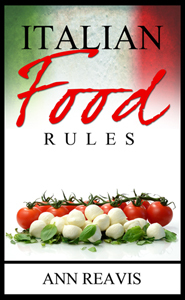 The Sasso di Dante supports this idea. Dante reportedly relaxed on this stone a lot, either (depending on the source you are reading): 1) watching the cathedral walls go up (the Duomo’s dome wouldn’t go on for another 150 years), 2) catching the cooling wind on summer days (it’s true, it’s one of the few places in town where the air moves in the summertime); 3) writing love poems (first poem at age 18 (1283); then between 1290 and 1293, he wrote Vita Nuova, a book of prose and poetry about his love for Beatrice), or 4) talking politics (Dante entered city government in 1295). But Dante was not always hanging out in Piazza delle Pallottole. He rode a horse into two, maybe three, major battles, managed the family estates, and as mentioned before, served as a political appointee. No reference book says Dante was watching games of bocce ball from his sasso, but Piazza delle Pallottole is so named because it was a piazza where the game of pallottole, a type of bocce ball game, was permitted to be played. 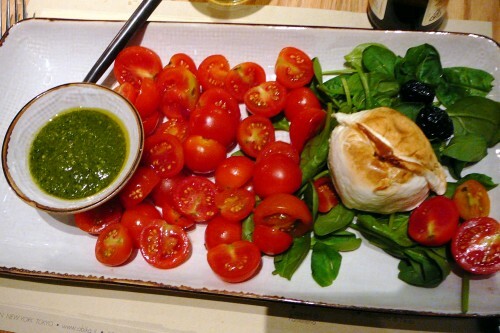 Today, there is an old trattoria called, not surprisingly, Sasso di Dante, that takes up most of the piazza. But back to the search for the plaque… One day, about two years ago I was taking a shortcut through the alley alongside the trattoria in Piazza delle Pallottole and there against the opposite wall, blocking a narrow sidewalk, was a huge stone with a metal tag that read “I Vero Sasso di Dante” (incorrect Italian (missing an apostrophe) for The True Stone of Dante). I swear on all three parts of the Divine Comedy it had not been there the month before. 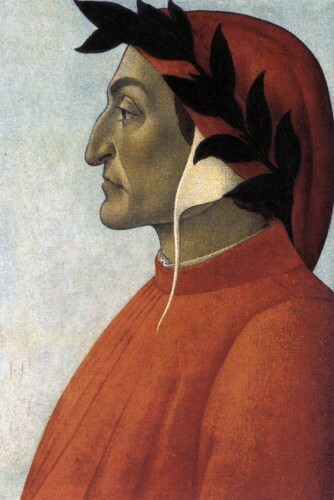 In the late 1800s, the poet Carlo Gabrielli, set Dante’s egg story in rhyme (ottava rima) and ended with the moral: L’acuto ingegno apporta gloria; / Maggior, se v’é congiunta alta memoria. 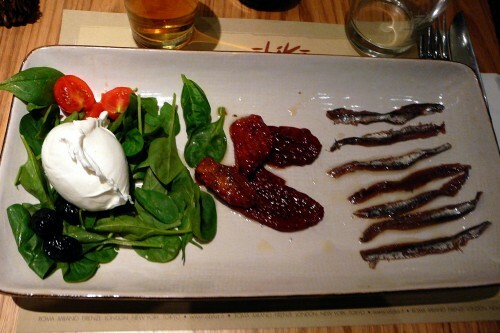 I’m not sure this is a tale of great memory or a savant’s selective focus. Dante was reportedly a peculiar guy. And by the way, I found the plaque. It’s very large, made of marble, and not in Piazza delle Palottole. It’s around the corner, in Piazza del Duomo, low on the side of a store that sells all things sacred (during this season – many crèches) and Catholic. I went in to ask when the marble sign was placed. 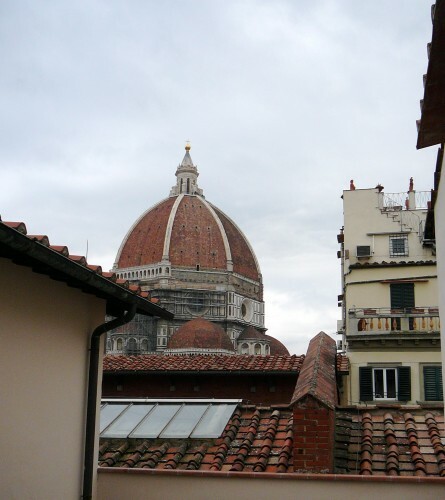 “Twenty years ago or more.” I had been walking past for more than ten years without noticing – easy to do in Florence where the past comes to greet even the longtime visitor every day. 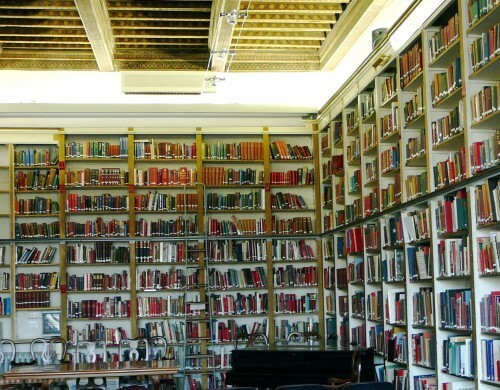 The most Anglo American-styled library in Florence, the Harold Acton Library, is owned and operated by the British Institute of Florence. Contained on 2 ½ book-lined floors, the library allows full access to the stacks and provides knowledgeable assistance to the collection and extensive archives. The full catalogue is computerized and is available on-line. 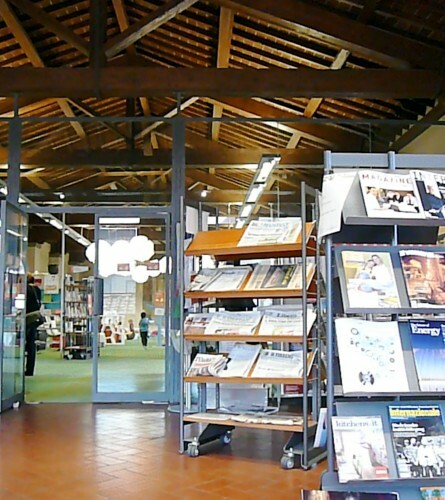 The Acton library contains the largest collection of English-language books in Italy. 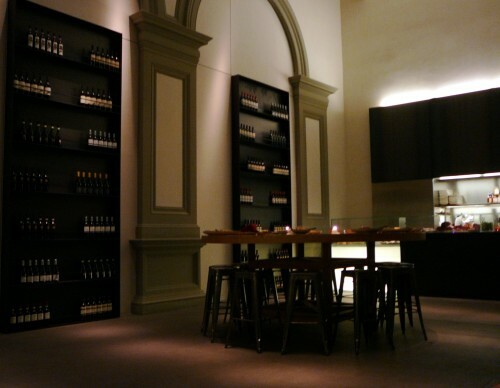 There is a reading room, furnished with ancient over-stuffed couches and chairs, where both English and Italian newspapers and a variety of literary, economic, news and travel magazines completely cover the coffee table. Computers are available to use for a fee, but it is rumored that free wi-fi may be offered in the future. 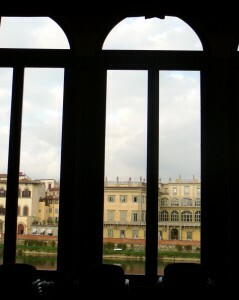 The library, with its panoramic views of the Arno River, was born from dozens of small donated collections and has matured into the present compilation of over 50,000 volumes published between the 16th and 21st centuries. About 500 new titles are added each year. The collection has a strong emphasis in history of art, English and Italian literature and language, history, travel, the Grand Tour (mostly undertaken by Brits and Americans in the 18th and 19th centuries), and music. The library has a couple of thousand literary novels by both American and British authors, mostly from the first half of the 20th century, enough to keep an expat busy catching up on a must-read list of the likes of Wharton, Austen, Henry James and Virginia Woolf. The library was named after Harold Acton. Harold’s father, Arthur Acton, well-bred, but poor, was from Shropshire. His mother, Hortense Lenore Mitchell, was a banking heiress from Chicago. When Hortense married Arthur in 1903 they moved into the Villa La Pietra on the via Bolognese in Florence – a short time later she bought it for him. Harold Mario Mitchell Acton was born at La Pietra in 1904, and grew up in the cultured and cosmopolitan Anglo-Florentine society before the First World War. He was sent to Eton and then to Christ Church, Oxford, where his contemporaries included Evelyn Waugh, Graham Greene, Cyril Connolly, and Brian Howard. Harold was an active member of the British Institute. 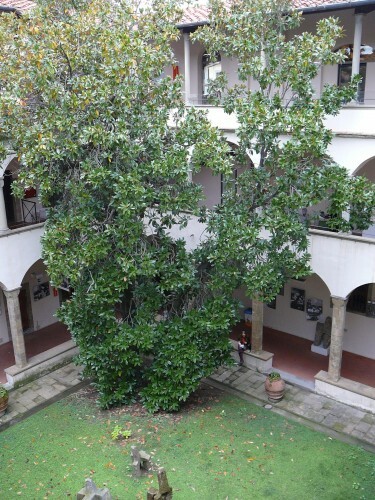 He joined the governing board in 1950 and made available his apartments in the Palazzo Lanfredini (in the Oltrarno neighborhood downstream from the Santa Trinita Bridge) for the library in 1966. When, in 1994, Harold died, he left his portion of the Palazzo Lanfredini to the British Institute and the Villa La Pietra and its surrounding properties to New York University. The Harold Acton Library can be visited free of charge and offers a free well-attended lecture series on most Wednesday evenings. To check out books and use the internet, a variety of fees apply. See the website. Americans and Brits usually find visiting libraries in Italy both frustrating and dissatisfying. The stacks are not open, so no browsing. You usually have to deal with a surly civil servant who will tell you that you do not have the right paperwork, but even if you did have lending privileges, it will take at least two weeks to obtain the books you are requesting and then you won’t be able to remove them from the premises and there is no place to sit down. 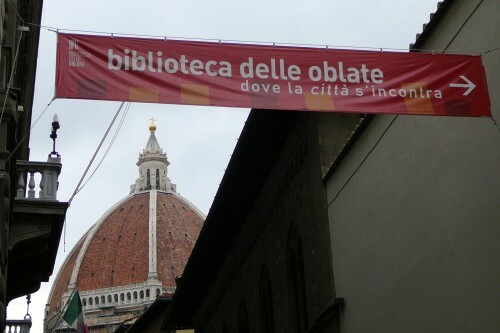 The Oblate Library is a long block from the Duomo and occupies the newly restored space of a huge 13th century convent of nuns – the “oblate”. 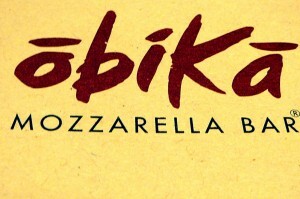 Oblate derives from the Latin for “colei che si è offerta” or “she who offered herself”. The semi-cloistered nuns served as nurses, cleaners and cooks at the Santa Maria Nuova Hospital from the time of Dante (the hospital was built by Beatrice’s father) through the 1400s when Leonardo da Vinci was examining corpses in the tunnels that ran below the convent and for over 400 years more – until 1936 – when a new convent was created near the much larger and more modern Careggi Hospital. The convent building was sold to the City of Florence. It first became the new home of the Museum of Prehistory as well as the central city government library that was moved from the Palazzo Vecchio. Then it was closed for years for a full restoration, which preserved the late-Medieval, early-Renaissance bones of the building while opening the warren-like space up for two libraries – one for studying and the other for lending books, DVDs and CDs. There is also a reading room where daily newspapers and monthly magazines are available in Italian, English, French and German. Computers and free WiFi are also available. Children run wild in the spacious colorful biblioteca per bambini. 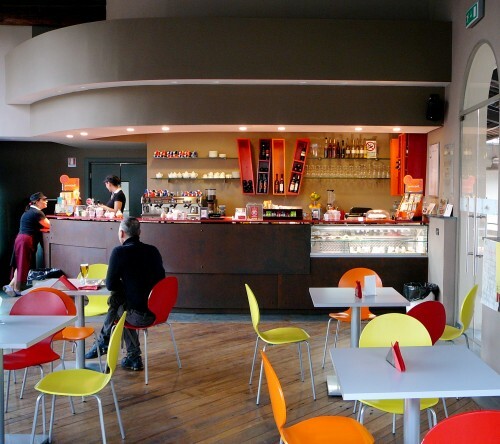 Parents can escape to the adjoining café with a view of the cathedral’s dome. On the second floor the museum of prehistoric artifacts has reopened and can be visited for a fee. La Biblioteca delle Oblate is worth a visit just for the panorama from the top floor or the sense of quiet offered in the walled cloister, but the friendly openness will bring you back to use the reading room, to listen to music in the outside loggia (where the nuns used to hang the hospital’s linen to dry), and maybe, even to peruse the book shelves holding a small selection of English fiction available for checkout for a month at a time. 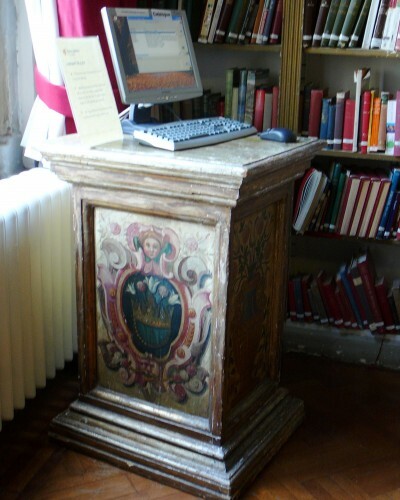 The website of the Oblate Library is not available in English. Hours: Mon. (2pm to 7pm), Tues. (9am to 10pm), Wed. to Sat. (9am to 7pm), closed Sunday.